Here we go! It is time to go climbing. In all my years of expedition climbing, I’ve rarely seen conditions as benign and favourable at such an elevation. Anticipation is high as we prepare to move up from Nido de Condores at 18,000ft/5,500m for our summit attempt. 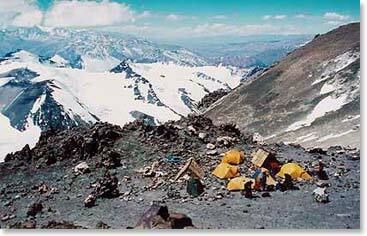 On Aconcagua, we’ll be climbing to roughly 23,000ft/7,000m to reach the top of the Americas. Remember that we are trying to reach the highest summit in the world outside of the great ranges of Asia; the Himalayas, the Karakoram and the Pamirs. We’re getting organized this morning at Nido, our advanced station. Simon is making his normal breakfast, quesadillas with cheese and ham, right off the grill. One good sign of acclimatization in any individual is a strong appetite and, I can tell you, this group definitely demonstrated strong appetites as Simon and the guys were preparing and serving their breakfast today. We did our medical checks after breakfast. Line listened to David’s lungs because he has had a mild cough. She gave him a careful examination, and based on his oxygen saturation, the level of his cough, and his basically clear lungs, David is clear to climb higher to Berlin Camp with us. Other than that, we’re all well, in fact, everyone including David is having a better second night at this elevation, which is what our intent is by moving slowly on the mountain. In a few more minutes, Nelson, Apolo, Juancho and Simon will start ahead of us up to Berlin camp, our high camp at 19,600ft/5,975m. They’ll put the tents up so everything will be ready for us when we arrive at the high camp. This group visited Berlin camp yesterday, doing a small carry up there. Everyone left their crampons and their other climbing gear stashed. So we’re ready to move up. This is a big day for us. Hugo seems confident and excited as he intends to reach the highest point on his continent, being from Brazil. Don and Kelly have been up at these high elevations on some other big mountains such as Denali, and they are drawing on their experience as we prepare to move higher. Old friends, Alex, Line and David from Berg Adventures Aconcagua 2008, are also gazing excitedly upwards, consistently reporting that they’re feeling better than last time and eager to get another chance tomorrow morning. Isabelle, who’s on her first big mountain, also feels confident and determined to achieve something unlike anything she’s ever done before. She looked very beautiful as she looked towards the summit this morning with the light in her eyes, not sure what’s ahead but excited to give it a try. Alain, who has been on another great mountain with Berg Adventures, the summit of Kilimanjaro, is getting ready to go. The work he’s doing to raise money for epilepsy, and awareness of this terrible disease, is inspiring. Alain is gazing upward as well and I can tell he’s going to give it all he’s got as we attempt to climb to the summit of Aconcagua tomorrow. At about 3:30 this afternoon, Simon will serve us a meal, and right after that, by 5:30 or 6:00 at the latest, I want the team to be settled down in their sleeping bags. We need at least 8-9 hours of quiet time in our bags at 19,600ft/5,975m before we awake at 2:00am to begin our summit attempt. The weather forecast is good and if it holds, we’re going to have a lot going in our favour tomorrow. We look forward to keeping you posted as we begin our ascent.